In a blog post, former business owner Jess Morris detailed how online bullying has impacted her and her family's lives. Photo sourced from Jess Morris' personal blog, White Picket Farmhouse. CAMPBELL RIVER, B.C. – Glen and Jess Morris are asking for the bullying to stop. The couple had a furniture designing business called The Rugged Rooster Creations. 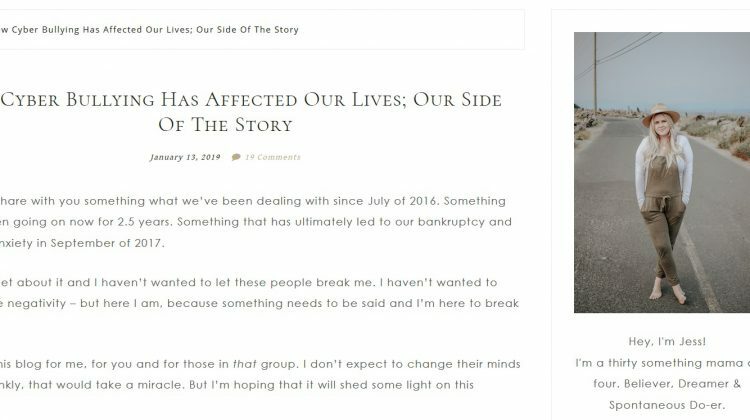 According to a blog post from Jess, the business did well for about a year but the couple started to fall behind with orders. She mentioned that neither she nor Glen had a business background or experience that could help them. As first time business owners, they admitted that there were transactions they hadn’t handled well. Jess detailed in the post that at one point, a client booked a $2, 000 order with them and they used that money to refund someone else. The initial client asked for a refund, but they weren’t able to give the money back. Other examples of the couple’s business practices are detailed in Jess’s blog post. The couple rebranded from The Rugged Rooster Creations to The Rugged Home in an effort to refresh the business and deal with other orders, but that didn’t work either. But as the business was failing, even through the rebrand, the Morris family also started to experience online abuse, especially from a certain Facebook group. “From there – from the end of the business – it was just downhill. The group just followed us, from business to personal life. A lot of the people in the group now, like 75% of them are not even our old clients,” Glen said. Glen alleged some of the people in the group were there to make negative comments and cause issues. Pictures of their family were shared online, and the family even received a death threat. The couple tried to finish orders and pay people back, but they didn’t have enough resources to refund everyone who asked. The couple filed for bankruptcy last October. According to Jess’s blog post, the comments kept pouring in, to the point that it started causing her anxiety. Glen alleged that posts on Jess’s blog and other social media accounts were always attacked, which led to her shutting down her Instagram. The couple is asking for the online harassment to stop, and for people to stop attacking Jess on her personal blog. They don’t have control over the Facebook group, but they are asking the group’s members to stop publishing negative comments about them.